The versatile, high-performance Moyno 2000 Progressing Cavity Pump features the highly acclaimed crowned gear universal joint drive train configuration to provide exceptional torque and thrust control. Patented joint seals effectively protect the gear joints from pumpage contamination. The Moyno 2000 pump line offers capacities to 2500 gpm and pressure capabilities to 1000 psi. Numerous models are available in a variety of construction materials with many different options, allowing customization to specific needs. 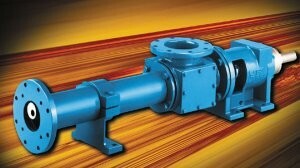 These options include: flush gland which allows packing leakage to be flushed away from the pump, preventing potential damage to seals and packing; a fiber deflector to prevent ragging around the pump connecting rod and rotor head, and a shaft sleeve which protects the drive shaft from wear in highly abrasive applications.